In the early twentieth century, Nashville’s Union Station was a bustling terminal, serving passengers traveling on eight railroads. 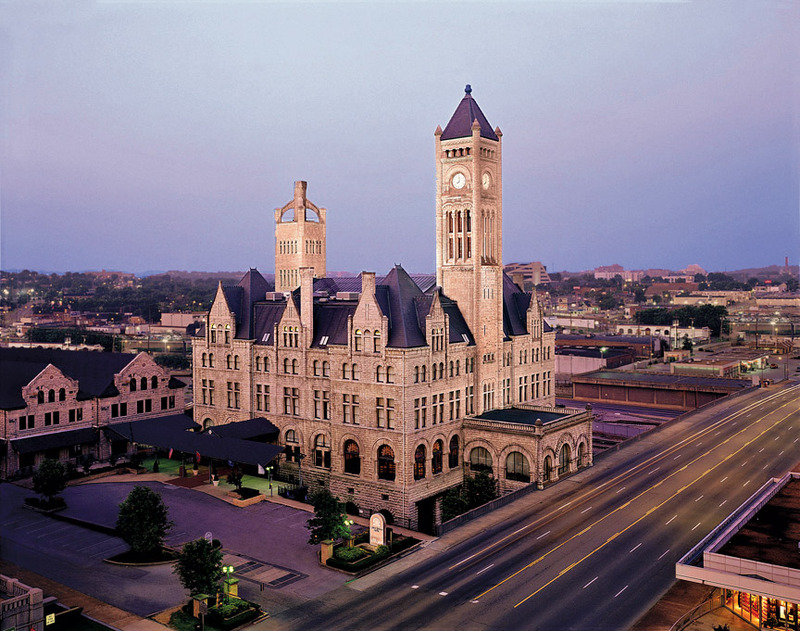 It was also an architectural marvel, with Romanesque Revival–style towers and turrets that made it a stunning downtown landmark. But by mid-century, the station—along with the popularity of rail travel—had begun to decline, and in 1979, it was abandoned. 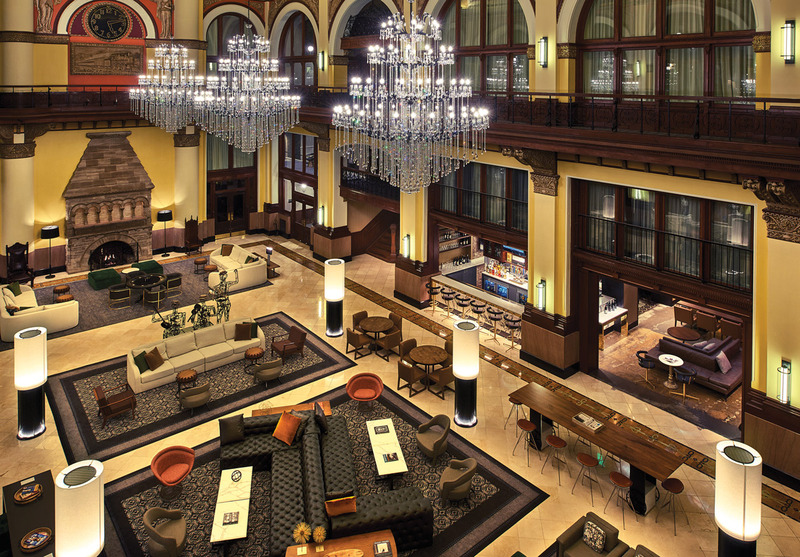 Nearly a decade later, with the help of some preservation-minded investors, Union Station Hotel was born. A $15.5 million renovation last year restored its polish and added modern touches, including marble bathrooms, ergonomic work spaces, and striking commissioned art pieces. My husband and I decided to bring our young daughters—who adore staying in even pedestrian hotels—to experience the property, but I admit I had reservations about bringing children to a boutique hotel without a pool. Turns out, I needn’t have fretted. Their jaws dropped as soon as we passed through the massive lobby doors. Warm light poured in through the original stained glass of the barrel-vaulted ceiling, which holds three massive crystal chandeliers. Gold-accented “angels of commerce” figures graced the atrium walls; below them, giant limestone fireplaces anchored the ends of the marble-floored sitting area. 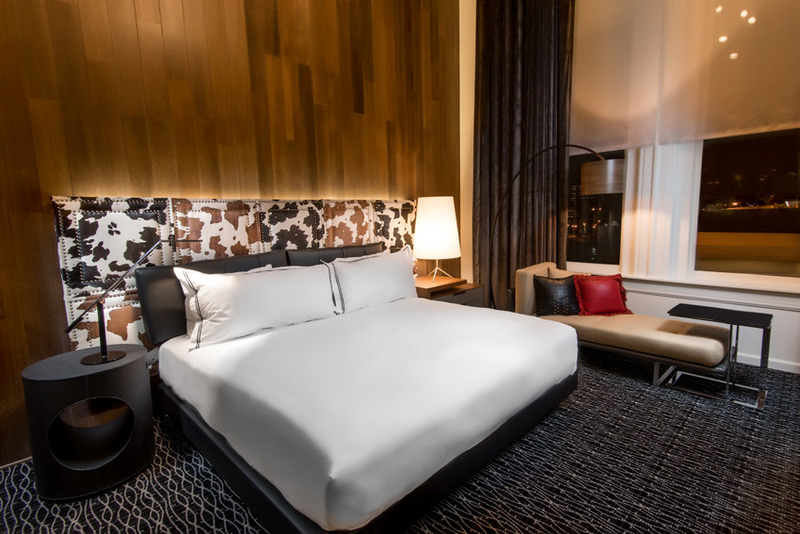 Upon entering our suite, we discovered that our room with a king bed, white oak accent wall, and custom cowhide headboard gave way to an adorable second room with bunk beds, bean bags, and a magnetic dartboard. My worries about child-friendliness flew out the window. Before heading out for dinner, we opted for a drink in the lobby at Carter’s Bar, situated at the terminal’s former ticket counter. I knew we made the right decision as I sipped the “Gladys,” made with local Pickers Vodka and named after Gladys “Happy” Carter, a beloved terminal worker from the station’s heyday. Seated in front of one of the fireplaces, we listened to live music (a frequent happening here) by a country duo called the Young Fables; my music-loving younger daughter was smitten with their Patsy Cline covers and original songs. As I finished my drink, I looked around the lobby at guests wheeling suitcases and people pointing at the stained-glass ceiling. In many ways, Union Station is experiencing another heyday, with travelers filling its terminal once again.